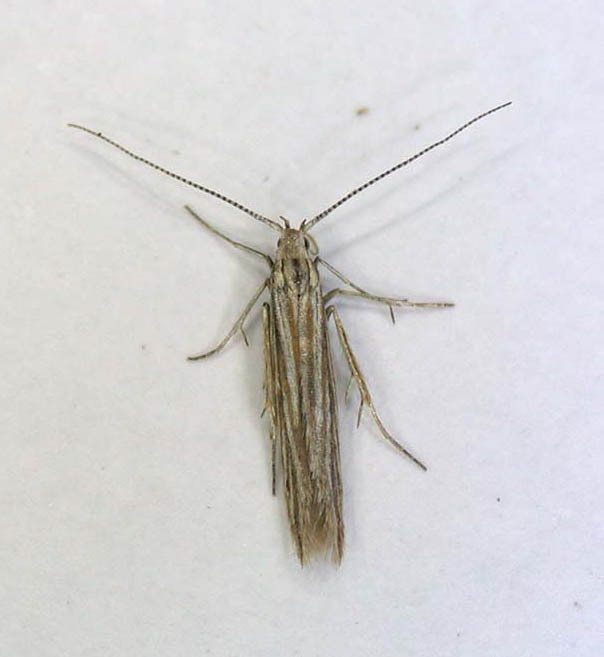 Leaf-miner and case-bearer: A straw-coloured, slender, three-valved tubular silken case, about 10 mm long. Mouth angle 45° to 60°. Perhaps because of the plant's dense felt cover, the case is attached with much silk, giving the holes a conspicuous white margin (Bladmineerders van Europa). The larva is illustrated in (Bladmineerders van Europa). Time of year - larvae: August until June of the following year (Bladmineerders van Europa). Distribution in Great Britain and Ireland: Widespread in Britain including Bedfordshire, Cambridgeshire, East Cornwall, East Suffolk, Hereforshire, Isle of Wight, Kincardineshire, Middlesex, North Essex, North Hampshire, Pembrokeshire, South Devon, South Essex, South Hampshire, South Northumberland, South-east Yorkshire, South-west Yorkshire, Surrey, West Cornwall and West Suffolk (NBN Atlas). Also recorded in the Republic of Ireland (Karsholt and van Nieukerken in Fauna Europaea). Distribution elsewhere: Widespread in continental Europe including Albania, Austria, Belgium, Croatia, Czech Republic, Danish mainland, Estonia, Finland, French mainland, Germany, Hungary, Italian mainland, Latvia, Lithuania, Norwegian mainland, Poland, Romania, Russia - Central and North, Sardinia, Slovakia, Slovenia, Spanish mainland, Sweden, Switzerland and The Netherlands. Also recorded in East Palaearctic (Karsholt and van Nieukerken in Fauna Europaea).